Janis Joplin was the first and biggest solo female rock star, bursting onto the scene in the mid-to-late 1960s with her fiery and soulful vocals, her colorful and outrageous clothes, and her devil-may-care attitude. However, her death from a heroin overdose in late 1970, only weeks after the death of Jimi Hendrix, relegated her to more of a cautionary tale as a charter member of rock and roll's 27 Club. This is a shame because Janis Joplin was a truly talented singer and beyond that, an important feminist icon who helped pave the way for women to break into the boys club that was rock and roll. In Scars of Sweet Paradise, author Alice Echols, who spent over five years extensively interviewing those closest to Janis and researching Janis' life, paints a portrait of a talented yet disturbed woman who more than anything craved attention and affirmation but never seemed to find it. Additionally, Echols places the story of Janis' life and career within the greater context of 1950s and 1960s America such that the book serves a dual purpose as an excellent history of the 60s counterculture and rock music scene. 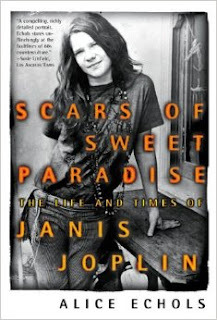 While this book isn't a salacious tell-all, the author doesn't shy away from detailing some of the more sordid aspects of Joplin's life, but she keeps the focus on Janis the person and not her various sexual and pharmaceutical escapades. Beginning with her birth in Port Arthur, Texas, Echols describes how Janis, the eldest child of Seth and Dorothy Joplin, never fit in, either within her family or her town. Dorothy was emotionally cold and domineering while her father was loving but distant as he could barely stand his wife. Janis felt further marginalized by her younger siblings, especially sister Laura, who to Dorothy was perfect in all of the ways that Janis wasn't. Bullied and teased at school for her looks, personality, and the fact that she marched to the beat of her own drummer in a town and era where that was looked down upon, Janis didn't so much grow up in Port Arthur as much as she endured it. However, she was incredibly smart, a talented artist, and a music lover who would sneak over the state line into Louisiana in order to hang out in predominantly black bars and clubs to drink and listen to her beloved blues, folk, and soul music. After high school, she was in and out of colleges as she bounced between Austin and San Francisco before finally joining Big Brother and the Holding Company in the summer of 1966. From here the band built up a steady fanbase and reputation before their big breakthrough at the Monterey Pop Festival in June 1967. Janis was suddenly a star although the increased media attention on her wild persona and her raw, unique singing voice began to crowd out the rest of the band and relegate them to mere backing musicians. While she did her best to resist going on a star trip, having a number one album and the relentless drumbeat from fans and her manager Albert Grossman to dump the band and go solo led her to leave Big Brother in December 1968. She struck out with a radically new band growing out of her desire to have a more soulful, dynamic sound. The new group included horns and keyboards, but the sudden change in sound and style alienated fans and critics and the lukewarm reception afforded her first solo album didn't help. A well-received performance at Woodstock, while not as incendiary as the one from Monterey, kept her popularity high but by the end of the year she broke up the band and struck out with her final line-up in 1970. More popular, this band (the Full Tilt Boogie Band) would back Janis for her final tours and her last album, Pearl, before her sudden death in October 1970. While Echols does a masterful job chronicling Janis' career, the real strength of the book is in how she dives into Janis' underlying unhappiness, insecurities, and the personality issues she never worked through during her short life. On one hand Janis reveled in being the hard-drinking, drugged-out, loud-talking, foul-mouthed, insatiably bisexual hippie chick the world made famous. On the other hand, she was always depressed by her perpetual lack of a stable long-term relationship, and on many occasions longed to find a good man, get married, have kids, and settle down...what she called her "white picket fence" fantasy. She also never got over the bullying and outsider status she carried with her from Port Arthur and could never really appreciate or enjoy the spoils of her fame and fortune because she suffered from what we would now call "imposter syndrome." Echols manages to set all of this against the backdrop of the rapidly changing American culture of the 1960s and shows that while Janis was well outside the mainstream with her public persona and music (while she still yearned to ultimately conform and live by it), it wasn't until after her death that her true impact as one of the early feminist rock icons was understood. This was especially true since during her life the supposedly enlightened 60s counterculture was still rampantly sexist and at times quite misogynistic. By placing Janis in her proper context and also spending a considerable amount of time at the end of the book deconstructing and assessing the 1960s, as well as the contrasting ways in which Janis was viewed immediately after her death versus how she's viewed today, Echols not only gives the reader a fuller understanding of those times, but of who and why Janis Joplin was the way she was. Scars of Sweet Paradise is an eminently readable and enjoyable book, informative and quite thought provoking in many places. It's richly detailed and clearly well researched (as evidenced by the extensive notes section at the end) yet it never feels overly scholarly or detached. Echols maintains her distance as an objective writer while still letting her admiration for Janis and her music come through. While the book could have focused perhaps a little bit more on the music, what discussion was there was enough and overall, this is one of the best music biographies I've ever read. When writing about someone as transcendent as Janis, and especially someone who died so young, the danger is always that the focus will be on the flame out instead of the art, but this is absolutely not the case with Scars of Sweet Paradise. If you're a fan of the 1960s and/or Janis Joplin, you need to read this book. Another great review that compels me to read the book. So much has been written about Janis that a book in lesser hands would be superfluous. It sounds, however, as if this book offers new insights ... always a welcome thing. Thanks! Hey man, thanks for the kind words! I hope you enjoy the book and please let me know what you think of it once you're finished. See you 'round the SH forums!